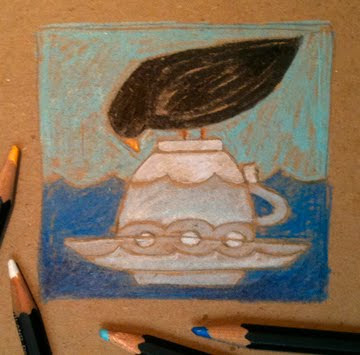 A busy schedule has me a little under water…so today’s cup is just a sketch on some cardboard with colored pencils. I do like it though…more later. I like blue and white china. I think a lot of people do. 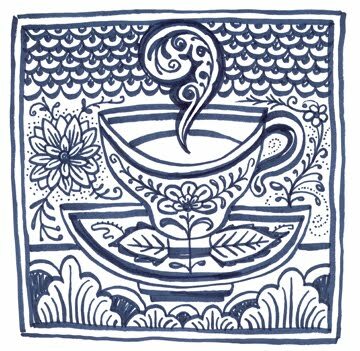 Speaking with a friend recently about it, we discussed the ancient China Trade route and how the blue and white Chinese porcelain inspired European countries–Portugal, France, The Netherlands, and England–to produce their own versions. So it is sort of an idea exchange, timeless and classic made new and then back to being timeless and classic. 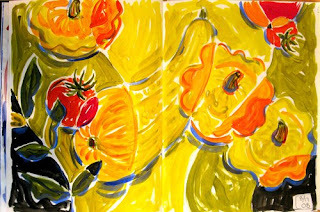 My drawing above has influences from a variety of patterns from my own collection at home. 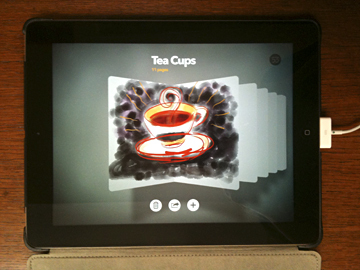 Ideas used to travel slowly from place to place…unlike now where sharing happens instantaneously. 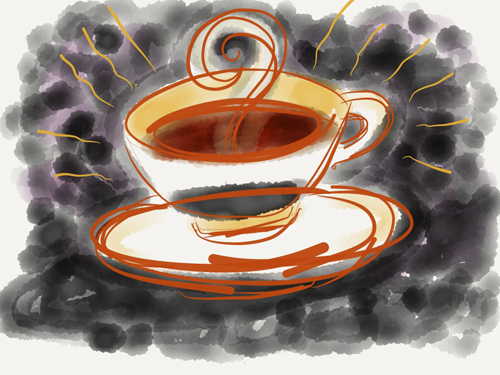 Maybe our communication can slow down slightly, just enough for some gracious thoughtfulness over a cup of tea. 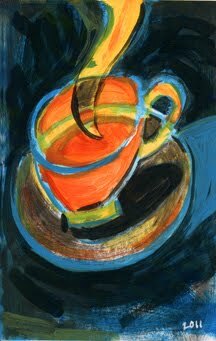 I am sharing a spontaneous moment of brushy color in the form of a cup and saucer from my sketchbook. I wanted to experiment with this color combination. 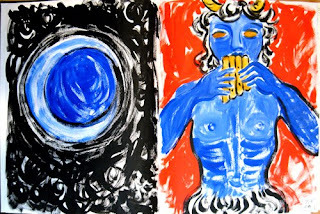 The warm and cool of complimentary colors – orange and blue against a black background. Orange is the color of warmth and energy (sounds like what a cup of tea gives me). Speaking of the color orange, I think of Orange Pekoe tea. Orange Pekoe is actually a black tea which is now known to have health benefits improving clogged arteries, helping treat diseases and making breathing easier for those with respiratory problems. So, tea has many benefits besides just focusing my mind. Orange as a tea flavoring is usually combined with spices. There are orange and herbal infusions, or those that have a black tea at the center with added orange-y and exotic flavors. 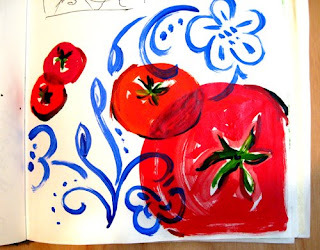 But here, just a taste of something from my sketch book. Last night we watched a wonderful film that we hadn’t seen for years, “My Father’s Glory” by Marcel Pagnol. It is his memories of childhood with his family, particularly one summer holiday in the country wilderness area of Provence. My thoughts turned to hot days and long summer evenings, so here are a few images from my sketchbook from this past summer.